An upgrade from the 3 in 1 Castle, the Big Combo is a huge jumper! It comes in two pieces -- a slide and a jumper -- which can be combined or placed separately! Perfect for parties with kids of all ages, as the divided sections allow younger and older children to play separately. The side stairs are fun to climb, and even more fun to slide down. Allows space for adult helpers. 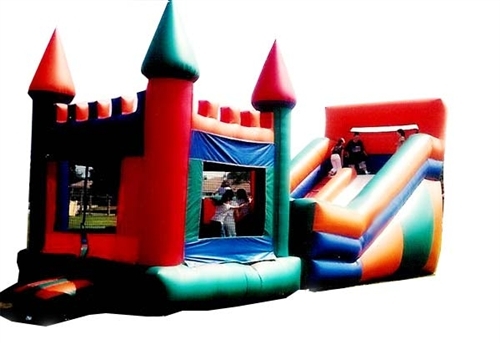 One of the most in-demand slide rentals on the market. Comes with an optional fitted basketball hoop.